We introduce you to a species of fish qualifying for treatment under the exotic heading because it is both expensive and possibly one of the most unusual species you will ever come across. First impressions can be deceptive and the image, right, is typical of how this species is depicted in many books. In the flesh a healthy specimen will appear solid black in colour having an appearance of velvet. For this reason alone it is striking and extremely desirable. However, this species has other strings to its bow and one of these makes it simply stunning. Before we elaborate upon this point let’s have a look at the origins of this species. Found in scattered localities through the tropical Eastern Pacific and is caught in shallow water particularly in the Philippines. It is known to feed upon zooplankton and benthic invertebrates. This only tells part of the story however as this species has a deep-water form that inhabits depths of over 200 meters. This gives us a clue to how this species might be unique. Anomalops belongs to the Family Anamolopidae , collectively known as the flashlight fish. This common name is given to them as they possess specialised organs that contain symbiotic bacteria capable of bioluminescence. Nourish these bacteria and protect them and a fish can utilise their amazing properties to their own ends. The splitfin flashlight fish covers the bioluminescent organ with a moveable flap of skin enabling it to “turn off” the light at will. After all, most species of fish would not want to attract the attention of potential predators and carrying a light around with you all of the time is not necessarily a good idea. But what are the advantages of producing light? Well, it is fairly common knowledge that light has an effect upon many animals of the world particularly those that synchronise certain behaviour with the lunar cycle. Think of moths being “attracted” to lights at night. This is because many species of moth use the moon to navigate by. Rather than flying towards the source of the light as it seems they are flying with it to one side, the left or right. If the moon is the only light source available to them they will never get any closer to it but if they are attempting to navigate by the light of a street lamp they will end up flying in a spiral pattern with an ever decreasing diameter and eventually the collide with it and spend their time continually butting it as its fills their vision. Many marine animals, including fish, will experience a positive effect when stimulated with a light source at night. Larval fish will swim towards light when they hatch in order to join the plankton layers and many other animals do likewise, even if it is just a vertical migration of plankton at night. Flashlight fish exploit this ruthlessly by harbouring bacteria that produce light and attract zooplanktonic animals, enticing them in close enough to be consumed. Apart from the use of the bioluminescence as a lure it also serves to partially illuminate the potential victims of this fish. The splitfin flashlight fish possess relatively huge eyes to catch the tiniest amount of reflected light bouncing back from other animals. It has also been suggested that this species uses its ability to control the light flashes produced in communication in which the eyes may also have a role. 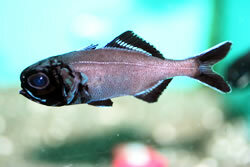 So the flashlight fish is a pretty animal that may not be to everyone’s taste if we judge it by looks alone. However, its fascinating behaviour and almost unique bioluminescence with the marine aquarium hobby (one other species of marine fish is sporadically available in the trade- Monocentrus japonicus is known by the common name Pinecone fish and is a fascinating species with close affinities to the family Anomolopidae) soon endear it to aquarists and those that can afford the price, around £40-75 each depending upon their size, will be treated to a regular nocturnal spectacle. Captive care of the splitfin flashlight fish is not completely straightforward and you should bear in mind the following before you commit to a purchase. First of all this is a shoaling species and will do better when maintained as such in an aquarium situation. The absolute minimum number that should be acquired is two and this certainly will put this out of the budgets of many aquarists. Bear in mind that the more individual fish a shoal contains, the greater the light show at night! Froese, R. and D. Pauly. Editors. 2005. FishBase. Relationship of the luminous bacterial symbiont of the Caribbean flashlight fish, Kryptophanaron alfredi (family Anomalopidae) to other luminous bacteria based on bacterial luciferase (luxA) genes.